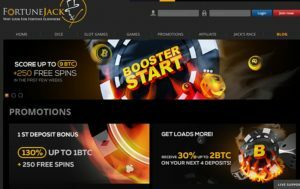 Fortune Jack, the sleek Curacao-licensed Bitcoin casino, has recently re-vamped its promo offers for new and existing players to stay on top of the ever-growing competition. And considering where the price of Bitcoin has ended up recently, it’s no surprise they’ve decided to switch things up. The casino, which already has a weekly Leaderboard race to keep their players stimulated, is now also adding several deposit bonuses for new joiners along with a monthly promo offer that adds even more BTC bonus infusions to the table. The biggest change was that the casino completely overhauled its welcome offer from the 100% matching bonus of 1 BTC for a complete “Booster Start” package of up to 9 BTC in bonus money + 250 Free Spins in your first couple of weeks after sign up. The perks start when you make your first deposit at the casino, which can get you a 130% matching bonus of up to 1BTC + 250 Free Spins. To claim the offer, you just have to be a newly registered player and make a deposit of 0.01BTC minimum. Once you spend your deposit, the 250 Free Spins will be automatically added to your account at a rate of 25 per day, for the next 10 days. The casino will also give you 30% bonuses on your next four deposits, each of which can be worth up to 2BTC. The minimum deposit amount is the same as with the first deposit bonus, or 0.01 BTC, but you have to make your next deposits within the first two weeks of signing up. All bonuses, including the first one and the free spins, come with 40x wagering requirements which you have to meet before you cash out. Once you become a regular at the casino, you’ll also be able to grab the “Month Mania” bonus, which is a matching offer that is handed out to players on every 30 days after the date of their registration. With this offer, you can grab a 30% matching bonus of up to 2BTC that comes with the same minimum deposit and wagering conditions (40x) as the standard welcome bonus offer. Another addition to the promotions catalogue at the casino is the Mid-Week Dice madness promo, which will recur every Wednesday. If you’re a fan of Dice games, you’ll surely love the promo, since during the period Fortune Jack’s Dice game will allow its progressive jackpot to be triggered by only 7 rolls instead of the 8 thus far required. Considering the jackpot is now at 22.2 BTC, you might just be tempted to go back every week. As a registered player, you can also enter the weekly Jack’s Race, which is a weekly tournament event with a guaranteed prize pool of 5BTC. To climb up the 10-spot ladder, all you have to do is play any game you want to collect the most points you can, without spending any money on tickets or buy-ins. All top 10 players will get a portion of the prize pool, while the luckiest player will get a top up of 1BTC. If you’re interested in checking out the new bonus offers or trying out Fortune Jack’s selection of Slots, Blackjack, or Live Dealer games, feel free to visit the casino.